Live updates on weather and road conditions as snow moves into the Tennessee Valley. Get the latest on your forecast here. 6:35 p.m. - Guntersville is reporting 0.3 inches of snow while Ider is reporting 0.2 inches. 5:56 p.m. - Marshall County road conditions are deteriorating in Arab, Union Grove and Grant. 5:15 p.m. - The National Weather Service has canceled the Winter Weather Advisory for Madison and Morgan Counties. 4:54 p.m. - Decatur police say road conditions are deteriorating across the city, including Beltline Road. 4:11 p.m. - DeKalb County EMA reports Alabama Highway 35 from Fort Payne to Rainsville and 117 in Ider are starting to ice. 2:54 p.m. - Huntsville police have shut down Bob Wade Lane between North Gate Drive and Material Lane, at the Toyota plant. Police are helping with traffic control in the area. 2:43 p.m. - The National Weather Service has canceled the Winter Weather Advisory for Colbert, Franklin, Lauderdale Lawrence, Limestone and Lincoln Counties. A wind chill advisory is in effect for all counties in the WAAY 31 viewing area until 10:00 a.m. Wednesday. 2:35 p.m. - We have a new top snowfall total in the Tennessee Valley. Underwood-Petersville in Lauderdale County is reporting 1.7 inches. 2:35 p.m. - ALDOT has shut down Highway 99 at Robinson Lane as crews are treating icy conditions. 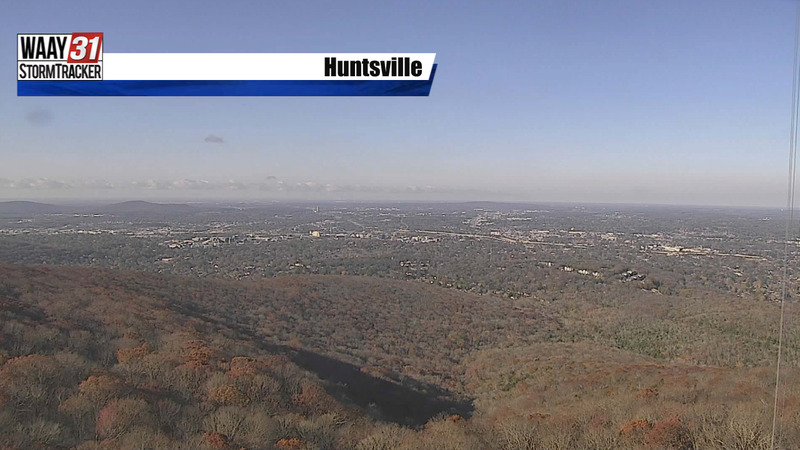 2:19 p.m. - The National Weather Service reports 0.4 inches of snow at the Huntsville International Airport. 2:14 p.m. - Alabama State Troopers said ALDOT has treated some bridges and overpasses and troopers are monitoring roadway conditions, but there has been icing on bridges and weather-related crashes across the area. Troopers said drivers should stay off the roads if possible. 1:28 p.m. - Alabama Highway 99 has reopened in Limestone County, but emergency crews warn the road is still icy. 1:15 p.m. - Limestone County emergency management reports Alabama Highway 99 is completely blocked at Robinson Lane because of a jackknifed truck. 12:46 p.m. - The National Weather Service is reporting various snowfall totals. Decatur (0.7 inches), Rogersville (0.5 inches), Madison (0.3 inches), Lauderdale County (1.5 inches), Fayetteville (0.8 inches), Franklin County (0.3 inches), Harvest (0.3 inches), Florence (1 inch). 12:35 p.m. - Decatur police said they have had five wrecks reported in the last three hours -- two in the last hour. 11:55 a.m. - Danville firefighters reported Highway 36 and many secondary roads in the area were starting to ice over. 11:20 a.m. - Limestone County EMA Director Rita White said the worst areas are in the northern part of the county. Highway 99 going toward West Limestone is bad, she said, and several wrecks have been reported on Interstate 565. 11:14 a.m. - Because of road conditions, Decatur police are only responding to multi-vehicle wrecks or single-vehicle wrecks with injuries or road blockage. 11:04 a.m. - Huntsville Utilities is asking customers to avoid using unnecessary lights and appliances in order to ease the demand for electricity. The Tennessee Valley Authority is asking for a voluntary curtailment of energy beginning at 3 p.m. The curtailment will be especially important during peak times of 5-9 a.m. and 6-10 p.m., TVA said. 10:21 a.m. - State troopers said they are working on several wrecks in Limestone County. Limestone County EMA: All roads in Limestone County have been deemed IMPASSABLE. This does not apply to streets in the City of Athens. 10:13 a.m. - Huntsville police have closed Bankhead Parkway at Gaslight Way going up Monte Sano. Numerous wrecks have been reported on Interstate 565 in Huntsville. Madison police are working two wrecks in the area of County Line and Browns Ferry roads. Drivers are asked to avoid the area. 9:50 a.m. - All roads and bridges in Franklin County are considered impassable, according to county EMA officials. In Madison, police said roads were beginning to ice over and drivers were being urged to use caution. Alabama State Troopers said there were not any significant hazardous road conditions, but drivers needed to keep an eye out for black ice. Anyone needing to report a traffic crash or other roadway emergency is asked to call troopers by dialing *HP (*47). 9:40 a.m. - Florence police are working several wrecks where vehicles slid off roadways and said roads there are beginning to ice over. Cox Creek Parkway between Helton and Wood Ave., Royal Ave, Roads around UNA, Mitchell Blvd approaching O’Neal Bridge, and Hermitage Drive are the bigger roadways seeing problems. Police said drivers should stay off the roads unless absolutely necessary. 9:28 a.m. - The Madison County Sheriff's Office says all secondary roads are becoming icy and treacherous and were urging drivers to stay off roads if possible. 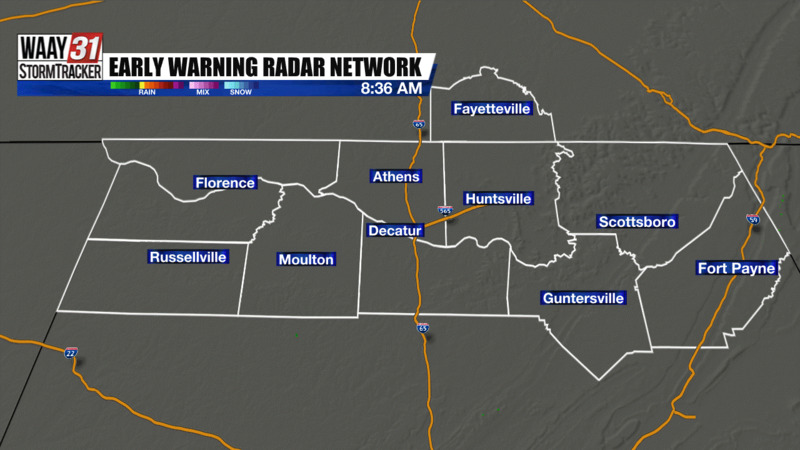 9:16 a.m. - Limestone County EMA was reporting several wrecks and advising people to stay home because of slick roads. 8:53 a.m. - Colbert County EMA says all roads and bridges should be considered impassable until further notice. 8:07 a.m. - Red Bay and Russellville were reporting slick secondary roads and overpasses, according to officials. Colbert County's EMA said conditions on Underwood Mountain Road and Frankfort Road in Tuscumbia were deteriorating rapidly. County Line Road and Highway 20 was beginning to ice over, according to the Colbert County Sheriff's Office. 7:58 a.m. - Athens police said they were starting to see a dusting of snow and some ice. Police Chief Floyd Johnson said streets weren't slick yet, but drivers should be careful on the roads. 7:50 a.m. - Florence police said street crews have put down sand on all bridges and are working on hilly areas. Roads in Lawrence and Morgan counties were still clear, with Lawrence County's EMA reporting that there had only been a light dusting so far. 7:35 a.m. - Lincoln County, Tenn., officials said snow was beginning to fall on the ground in the county. In Florence, more roads were reported to be slick with snow and ice, including Royal Avennue, roads in the industrial park, Florence Boulevard at Huntsville Road and the southern portion of Cloverdale Road. Colbert County authorities were warning of slick conditions in Cherokee and Sheffield. Drivers were urged to use caution. 7:04 a.m. - Florence police said overpasses were beginning to get slick as snow moved into the Shoals Tuesday morning. Colbert County emergency management officials said they had also started getting reports of slick roads in Sheffield and on Old Lee Highway in Tuscumbia.